Spring has a lot going for it. Flowers, open windows, and longer daylight hours are a few bonuses. Two more are fresh halibut and fava beans. The fava beans make you work for their delightfulness, but that’s balanced out by how simple it is to sear some halibut. I’ve mentioned before how much I like the book Sunday Suppers at Lucques and the way it’s divided into chapters according to seasons. The spring chapter might be my favorite, and that’s where I found this dish. It couldn’t be more of spring if it tried. The meyer lemon salsa with the creme fraiche flavored with savory was just the right lively touch to top the potatoes, favas, and fish. And, there were pea shoots. Suzanne Goin seems to like pea shoots in the springtime because they appear in several recipes in this chapter, but they’re delicious and crisp and fresh and work well in each case. I was worried that I might have to make some substitutions for this dish because I don’t usually see the herb savory or pea shoots in local grocery stores, and I wasn’t sure if favas would be available yet, but I knew that halibut was ready and waiting. Luck was on my side, and after only searching at two stores, I found everything I needed. The meyer lemon salsa can be made in advance, and I got to use two of the last lemons on my tree. One lemon was zested for the fish, and then both were peeled and supremed and the juice was collected. The lemon juice was combined with minced shallots and salt, and then olive oil was whisked into it. Chopped savory, mint, and parsley were added along with the lemon segments. Also, the creme fraiche was prepared in advance, and that only involved stirring chopped savory leaves, salt, and pepper into some creme fraiche. The halibut was marinated with lemon zest, thyme, and parsley and left in the refrigerator for a few hours. Then, it was time to address the fava beans. Removing them from their pods is no big deal. The trouble starts when you have to blanch the beans and then remove each and every bean from its skin. There’s no way around it, you just have to skin each one, but since Kurt helped, the task was completed in record time. Up next, fingerling potatoes were par-boiled, allowed to cool slightly, and gently smashed. The potatoes were then warmed in a skillet with melted butter, and then the favas and pea shoots were added to that skillet. Meanwhile, the halibut was simply seared in olive oil for a few minutes on each side. The dish was plated with potatoes, favas, and pea shoots topped with creme fraiche and meyer lemon salsa, then came the halibut and more creme fraiche and salsa. The creme fraiche added a touch of richness to the light fish and vegetables and the salsa worked perfectly with each part of the dish. I’m embarrassed at how quickly my plate became empty, but with these fabulous, fleeting spring flavors brought together so nicely, it couldn’t be helped. You know me, I'm veg, but that is a beautiful plate of food. So nicely plated. I love that book too and used it last night. Great job, Lisa! looks so fresh and spring-y. i'm not usually one to spend time doing things like shelling, but i could definitely make an exception in this case. and great photos! Love all component that goes into this fish. Great post for Friday Lisa! Yum. Spring in a bowl. I made a risotto with broad (fava) beans and asparagus recently and didn't bother skinning the broad beans and they were fine. I think the key is using very young beans. Wonderful presentation. 2 of my favorites Halibut and Meyer lemon. You have a wonderful blog. What a grand dish this is!!! 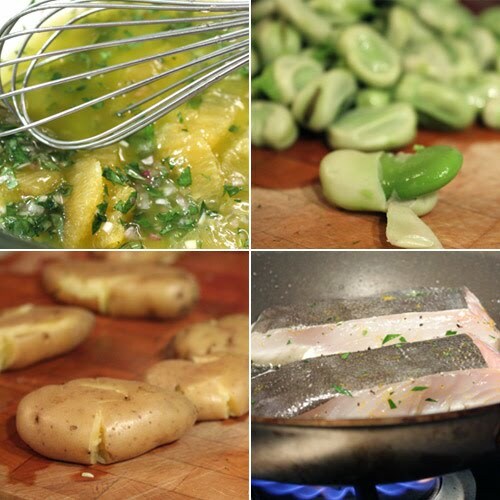 I so love halibut & fava beans!! That meyer lemon salsa sounds so good too! A splendid dish that looks so professionally executed! Everything here is light and airy and is breathing spring air! I am not to adventurous to try out different fishes, but I think now it is time I get some halibut. Would love to have a meal this way. What a delightful meal that must have been! What a wonderful dish with those spring vegetables. Would love to be eating this for dinner right now. That looks seriously better than anything I could get a restaurant around here! Amazing! Sunday Suppers at Lucques is a spectacular book - I love mine. Right when I saw the photo, I thought of the book. I look forward to Spring and adore fava beans. Great job on the photo!!!! Oh my goodness, you did not say you were opening up a restaurant. Love the looks of this dish. Have to agree Sunday Suppers at Lucques is awesome! Oh wow, such a gorgeous dish and I especially love the idea of Meyer lemon salsa! What excellent flavours you have going on here, and as usual, you have presented it so beautifully. Hope you have a wonderful easter weekend ahead of you. Love the colours on it. And Meyer lemon salsa... ahhh, spring is heeeeere~! I bet this tastes like heaven!! How gorgeous that halibut looks! Happy Easter ! this meal has EVERYTHING! you've prepared the quintessential spring plate here, lisa, and except for the fish (i can't help it), it all appeals! the zingy salsa and fava beans are especially lovely--excellent work! I just love all of the components of this dish. I never met a Meyer lemon or a piece of halibut that didn't marry well together. 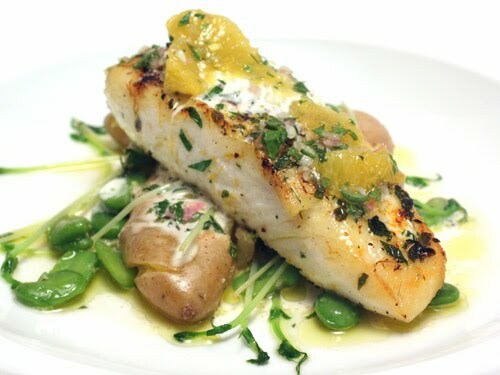 A beautiful spring dish...that halibut and the feve(my favorite) epitomizes the bounty of spring.. I love halibut tooooooooooooooo! This dish looks light, yet so flavourful! Where, oh where, do I begin? I was already envious over your Meyer lemon tree but the meyer lemon salsa is something that could soothe the sting. Fava beans are on my must-make list; they look so good that I just might not mind having to skin each and every one. 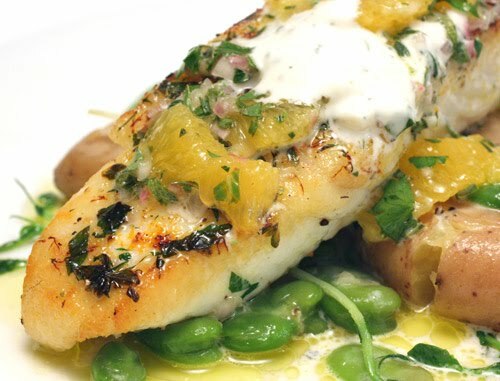 Finally, your halibut is cooked to absolute perfection! I still have not figured out how to sear fish just so . . . This is a gorgeous dish, as always! Oh...my...god...Lisa, this has to be the BEST recipe to date! It's just popping off the page with fresh flavors and ingredients...ah, this is the PERFECT spring dish! I'm seriously drooling like a mad dog right now! Oh, this is a keeper! Very doable. Love the combination of ingredients. Wishing you a Happy Easter Lisa. I love halibut with mango-kiwi salsa. Wow, I love your take on halibut with meyer lemon salsa and gosh, have I told you before I love fava beans too? I am totally starved now!